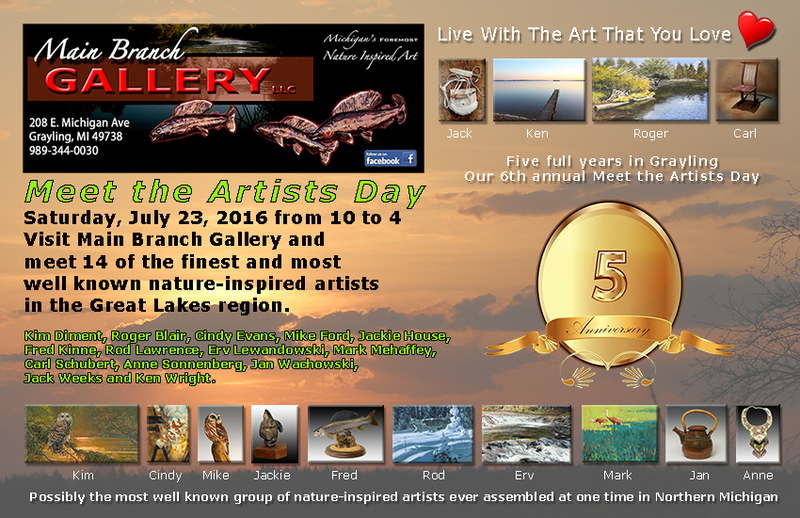 Saturday, July 23th, 2016 will be our sixth annual “Meet the Artists” day from 10:00 am to 4:00 pm. Visit us for a delightful open house of “Nature Inspired Art” and meet the following thirteen of our very talented artists. 1. Kim Diment – Co-owner of Main Branch Gallery, signature member and three-time winner of the award of excellence from the Society of Animal Artists. She is officially ranked in the top 100 wildlife artists in the country and is one of the most award winning artists in our gallery. 2. Cindy Evans – Award winning watercolor artist, ranked by Watercolor magazine as one of the top 10 “Ones to Watch” watermedia artists. Her work has been juried into prestigious exhibits including the American Watercolor Society’s International Exhibit in New York City. 3. Mike Ford – An award winning Master Woodcarver specializing in wildfowl and songbirds. He has won awards in Ward World Championships in Ocean City, Maryland, the North American Wildfowl Championships in Livonia, Michigan, ODCCA Decoy Show in Cleveland, Ohio and numerous local competitions in his home state of Michigan. 4. Jackie House – Native American Sculptures, Pottery and Paintings. A multi-media artist, Jackie’s award winning artwork has been featured in numerous exhibits, shows and magazine articles. Several award winning sculptures are displayed in the gallery. 5. Fred Kinne – Master Fish Carver of Michigan game fish and in particular, trout native to the AuSable and Manistee rivers. Fred’s remarkably lifelike carvings and perfectly reproduced painting set him apart from other woodcarvers. He was commissioned to create a carving of every fish in the Great Lakes for the Great Lakes Wildlife Museum in Julianstown, Ireland. 6. Rod Lawrence – Realistic wildlife and nature art. Rod is an author, lecturer and has been a professional wildlife artist for over 40 years. Rod is a signature member of the Society of Animal Artists, an award of excellence winner, and one of the most awarded and acclaimed artists in our gallery. 7. Erwin P. Lewandowski - Recognized as one of the foremost contemporary realist/hyperrealist artists in the country. Signature member of the Colored Pencil Society of America with numerous national and international awards. 8. Mark Mehaffey – Internationally known as one of the finest watercolor artists on the planet. His over 50 years of painting has brought him awards and accolades from every major watermedia society. He is an acclaimed juror of national watercolor exhibitions and shows. 9. Carl Schubert – Master craftsman of award winning wood furniture. Carl’s goal in his creations is to build the most comfortable, aesthetically pleasing, furniture possible. The furniture in the gallery attests to his success. 10. Anne Sonnenberg – “Painting with Beads” is how Anne describes her bead embroidery work which combines stringing and beadweaving techniques. Art has always been a part of her life, graduating from Eastern Michigan University with both a Fine Arts Degree and Elementary Teaching Degree. 11. Jan Wachowski - Jan has been a teacher and functional Potter for over 40 years working with a variety of clay bodies, and mixes her own glazes. All of Jan’s ware is safe for food consumption, ovenproof, microwaveable and dishwasher safe. Currently she is interested in clay carving and surface decoration. 12. Jack Weeks - Replicated Leather Work of the 17 & 18 Hundreds. Jack selects bag shapes and materials that were used in those years and crafts them with the types of hand tools that were available at that time. These early bags and horns were originally crafted by harness makers, cobblers, and cord winders. 13. Ken Wright – Co-owner of Main Branch gallery, Ken’s award winning nature and landscape photography is offered in numerous sizes of canvas Giclee and glossy prints.